(L–R) Dwayne Finley, Travis Nelson, Aldine Strychnine, Ron Ward and Davey Parish started industrial-tinged punk band Gnawing Suspicion almost 30 years ago! 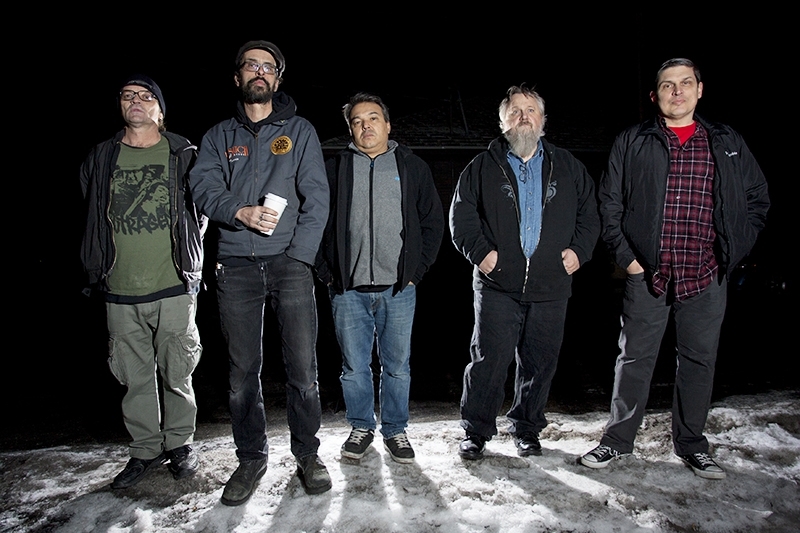 This month’s Localized is a meeting of veterans of Salt Lake’s original punk scene and the new breed of local soundsters creating their own musical voice—the experimental, dub-influenced Muzzle Tung open. The Guard Cats have existed barely a year, but they display a diverse sonic palette. On the other end of the continuum, Gnawing Suspicion was one of the first Salt Lake punk bands coming out of the mid-’80s. This inter-generational insurrection will take place Feb. 14 at Urban Lounge at 9 p.m., emceed by Ischa B. and sponsored by Bohemian Brewery and KRCL. It’s $5 to get in if you’re 21+. Aldine saw a performance by Survival Research Laboratories, and their remote-controlled robots would have an impact on Gnawing Suspicion’s “industrial punk rock” music. “[SRL’s] Mark Pauline was going around finding ‘Obtainium’; whatever big sheets of metal they could find to make those things. We did the same thing: We had a big, huge sheet of metal we used to use. That was back in the old Painted Word building, back around 1983–4.” That was around the time they started playing. Ward describes their attitude: “It was a mixture of art and anger,” he says. It was the heyday of industrial music in the ’80s, and they played with local bands like the Clocks and Dr Naugahyde. There weren’t a lot of touring industrial bands, so they ended up on a lot of punk bills, opening up for NoMeansNo and even the The Flaming Lips once, back in their raw, early days. They each were in a lot of different bands back then, and Finley ran some underground venues like the Hate House, where his band, Hate X9, often played. Gnawing Suspicion’s sound gradually changed to more conventional song structures, though they still incorporated the noise, the metal, sparks produced by a grinder and fire-blowing. Parish has written most of the songs. He says, “All the songs, with a few exceptions, are from back then. One of the first ones was ‘Adam Swapp’ [about the polygamist who was imprisoned for bombing an LDS church in 1988, and was paroled last year].” The new and old songs combine, forming a sound that’s like an old-school punk band playing in a foundry, pounding out angry riffs to the clanging of metal. “Brigham Young’s got his back to the temple—he’s got his hand out to the bank/You’ve got to be a Mormon here if you want to have a good social rank. Whose underwear is under there?” Parish stole the last line, and song title, from an old Hanes commercial. New song “Attack of the Drones” takes on a more current issue—robotic NSA surveillance drones. “With everything going on in the world, we’re even more pissed off now,” says Aldine. After SLUG Magazine founder JR Ruppel released his City by a Dead Lake compilation, Finley released his Dead City By A Lake comp in 1988, on which both Maimed For Life and Gnawing Suspicion appear, and which is being re-issued. The band hasn’t released anything else, but is working on some new material for release. Aldine has also produced the With A Little Help From My Friends music festival near Torrey for three years. You can check out Gnawing Suspicion at facebook.com/GnawingSuspicion.